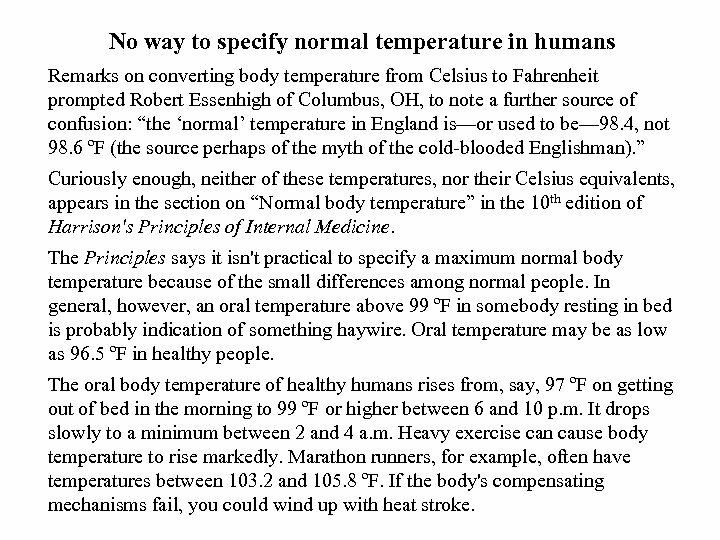 No way to specify normal temperature in humans Remarks on converting body temperature from Celsius to Fahrenheit prompted Robert Essenhigh of Columbus, OH, to note a further source of confusion: “the ‘normal’ temperature in England is—or used to be— 98. 4, not 98. 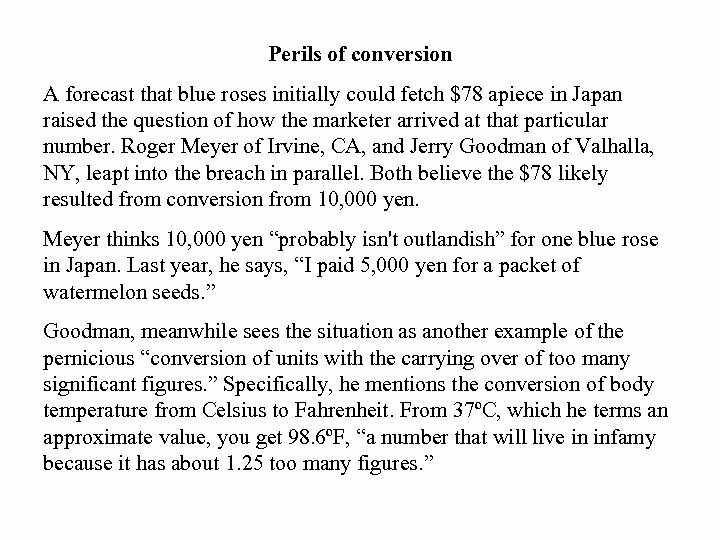 6 ºF (the source perhaps of the myth of the cold-blooded Englishman). 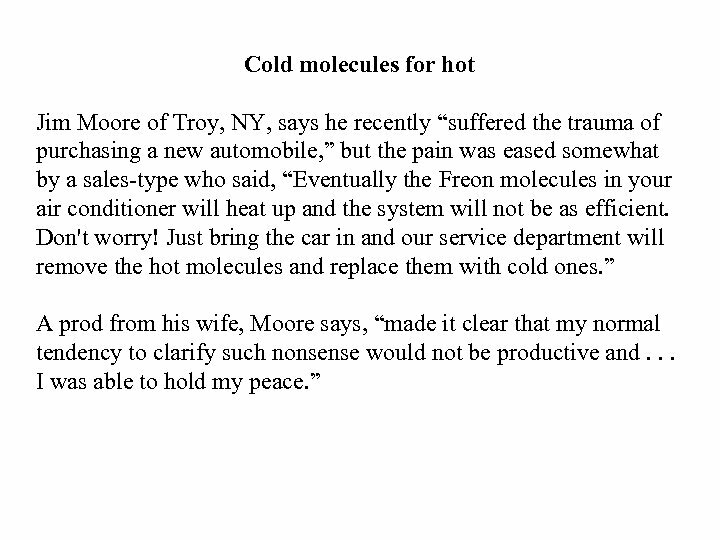 ” Curiously enough, neither of these temperatures, nor their Celsius equivalents, appears in the section on “Normal body temperature” in the 10 th edition of Harrison's Principles of Internal Medicine. The Principles says it isn't practical to specify a maximum normal body temperature because of the small differences among normal people. In general, however, an oral temperature above 99 ºF in somebody resting in bed is probably indication of something haywire. Oral temperature may be as low as 96. 5 ºF in healthy people. The oral body temperature of healthy humans rises from, say, 97 ºF on getting out of bed in the morning to 99 ºF or higher between 6 and 10 p. m. It drops slowly to a minimum between 2 and 4 a. m. Heavy exercise can cause body temperature to rise markedly. Marathon runners, for example, often have temperatures between 103. 2 and 105. 8 ºF. If the body's compensating mechanisms fail, you could wind up with heat stroke. 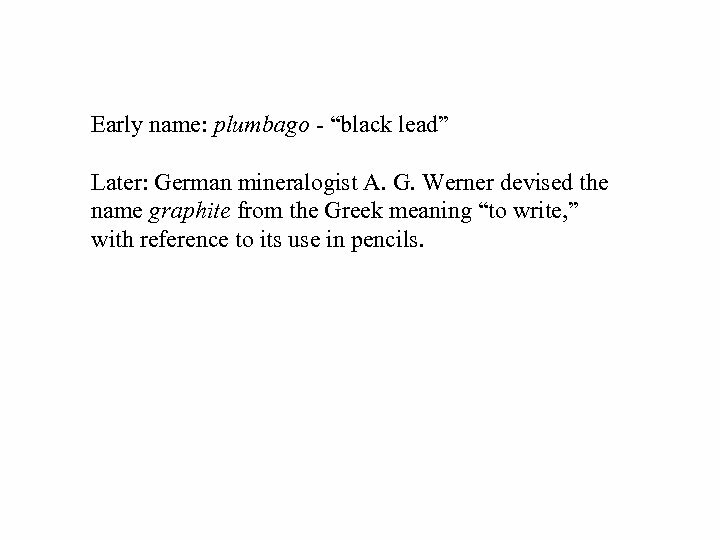 Early name: plumbago - “black lead” Later: German mineralogist A. G. Werner devised the name graphite from the Greek meaning “to write, ” with reference to its use in pencils. 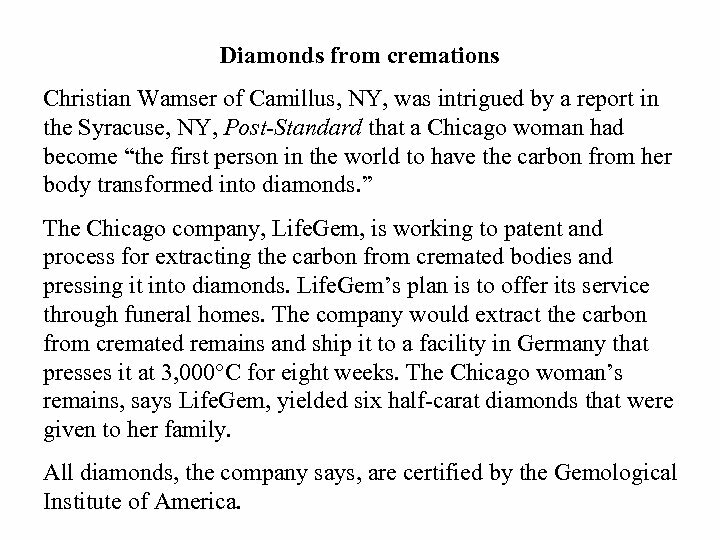 Diamonds from cremations Christian Wamser of Camillus, NY, was intrigued by a report in the Syracuse, NY, Post-Standard that a Chicago woman had become “the first person in the world to have the carbon from her body transformed into diamonds. ” The Chicago company, Life. 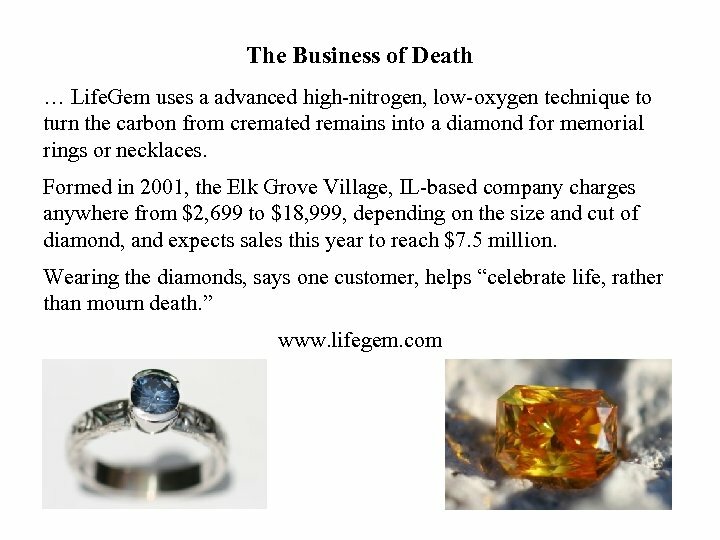 Gem, is working to patent and process for extracting the carbon from cremated bodies and pressing it into diamonds. Life. Gem’s plan is to offer its service through funeral homes. The company would extract the carbon from cremated remains and ship it to a facility in Germany that presses it at 3, 000°C for eight weeks. The Chicago woman’s remains, says Life. Gem, yielded six half-carat diamonds that were given to her family. All diamonds, the company says, are certified by the Gemological Institute of America. 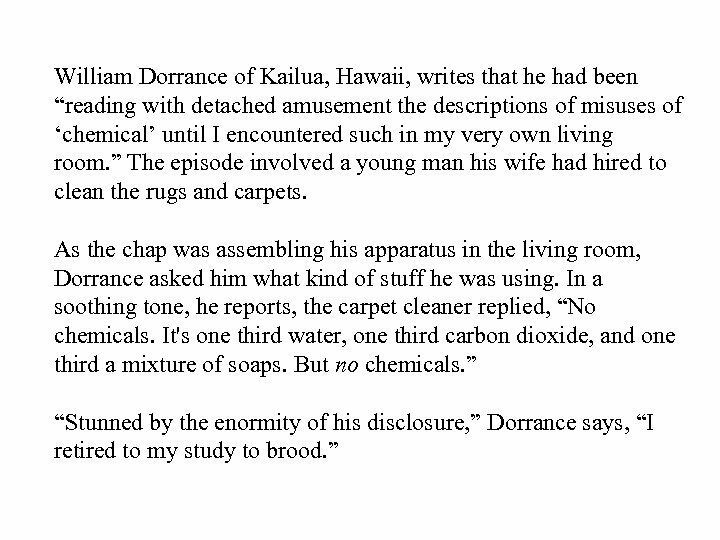 EPA stops boy scientist Al Denio of Eau Claire, WI, pointed out the Associated Press dispatch about an unidentified lad, age 18, who was trying to isolate all the elements in the periodic table. The boy lives in Union Lake, MI, about 25 miles northwest of Detroit. 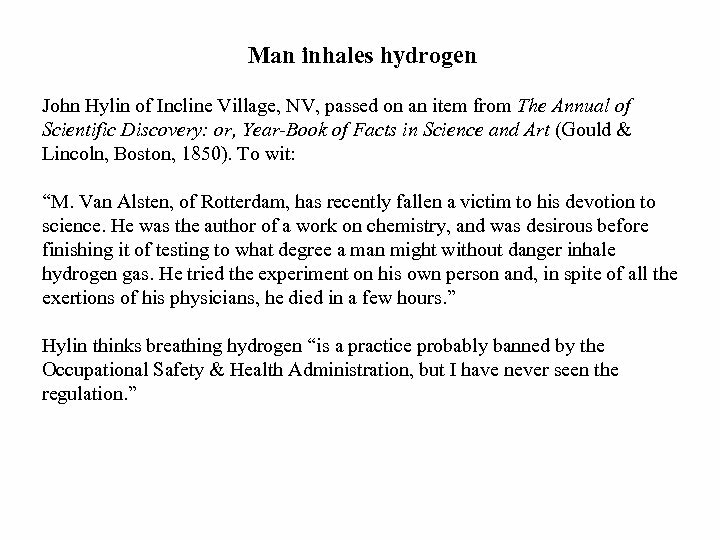 Among other feats, he had made a Geiger counter, isolated thorium from old lamps and americium from smoke detectors, and had acquired some radium of undetermined origin. Somebody must have ratted on the kid, however, because the Environmental Protection Agency turned up. EPA's Jack Barnette, according to AP, said, “He [is] a pretty bright kid. . . He didn't think he was doing any harm. 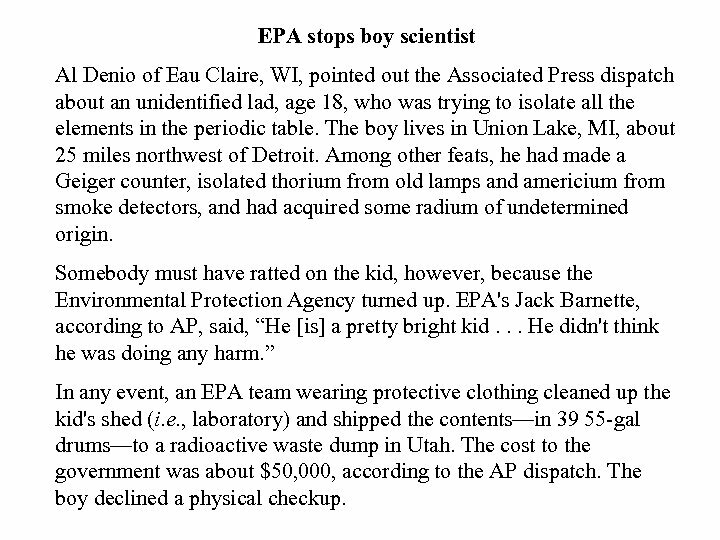 ” In any event, an EPA team wearing protective clothing cleaned up the kid's shed (i. e. , laboratory) and shipped the contents—in 39 55 -gal drums—to a radioactive waste dump in Utah. 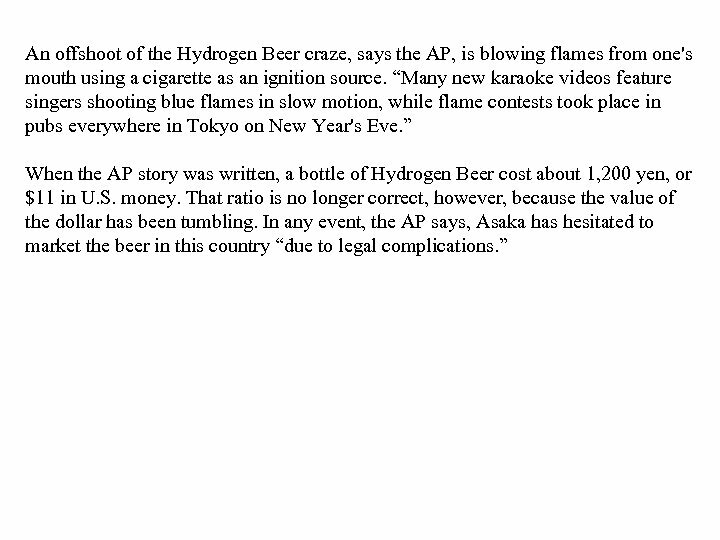 The cost to the government was about $50, 000, according to the AP dispatch. The boy declined a physical checkup. 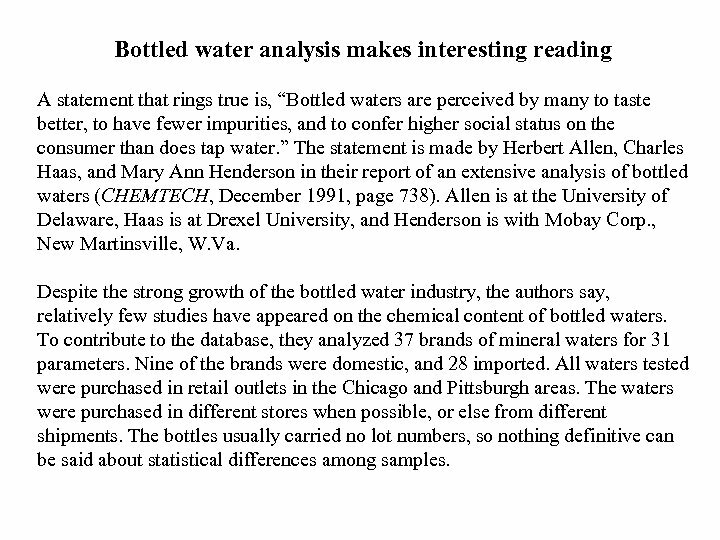 Bottled water analysis makes interesting reading A statement that rings true is, “Bottled waters are perceived by many to taste better, to have fewer impurities, and to confer higher social status on the consumer than does tap water. 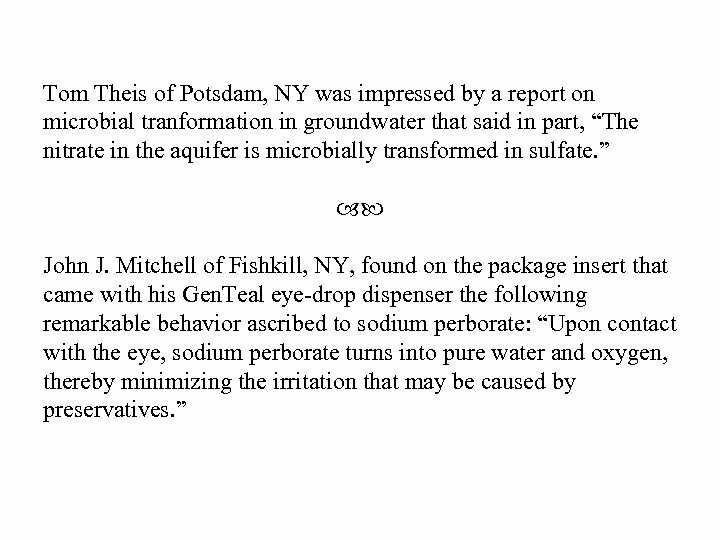 ” The statement is made by Herbert Allen, Charles Haas, and Mary Ann Henderson in their report of an extensive analysis of bottled waters (CHEMTECH, December 1991, page 738). Allen is at the University of Delaware, Haas is at Drexel University, and Henderson is with Mobay Corp. , New Martinsville, W. Va. Despite the strong growth of the bottled water industry, the authors say, relatively few studies have appeared on the chemical content of bottled waters. 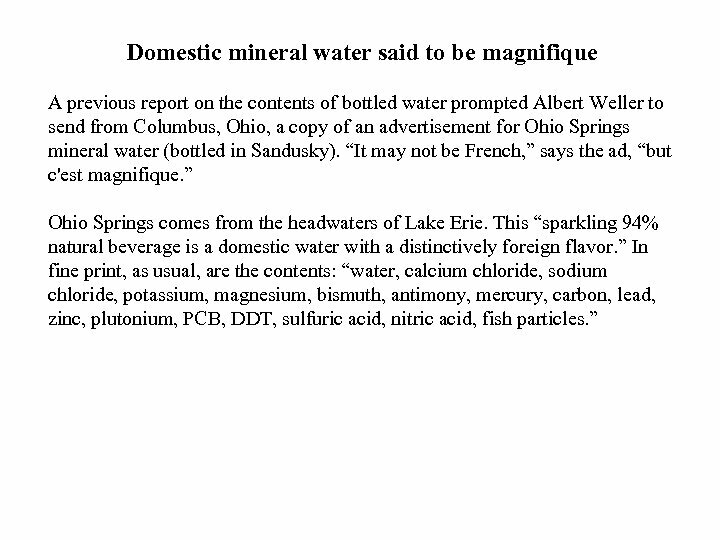 To contribute to the database, they analyzed 37 brands of mineral waters for 31 parameters. 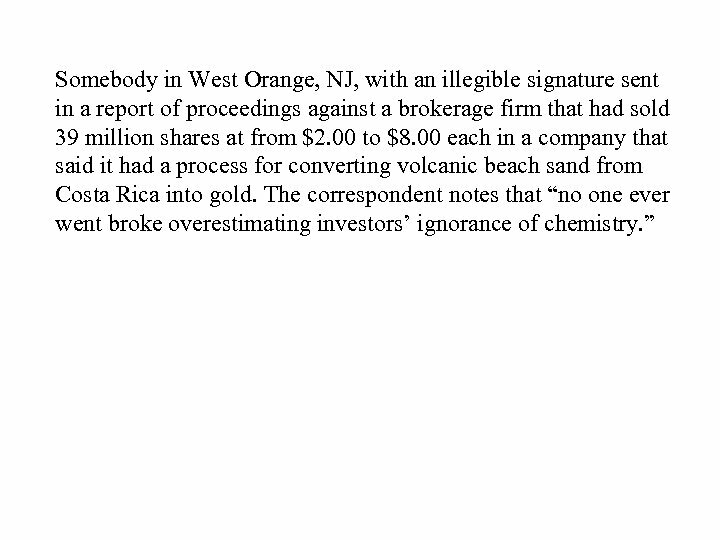 Nine of the brands were domestic, and 28 imported. 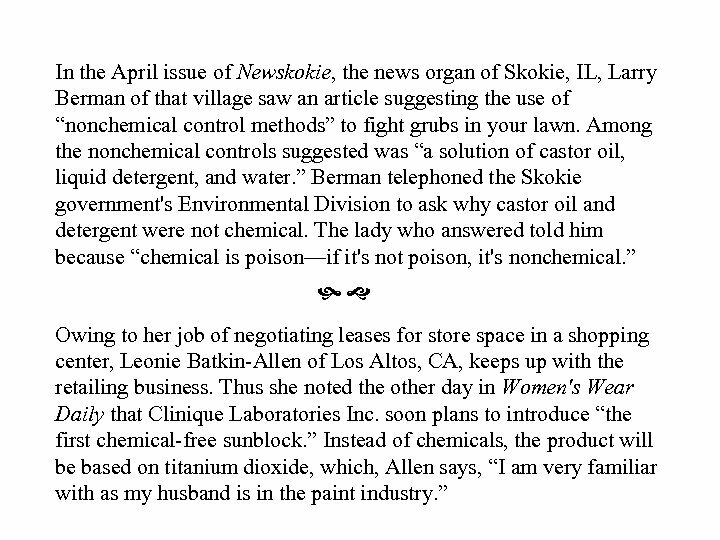 All waters tested were purchased in retail outlets in the Chicago and Pittsburgh areas. 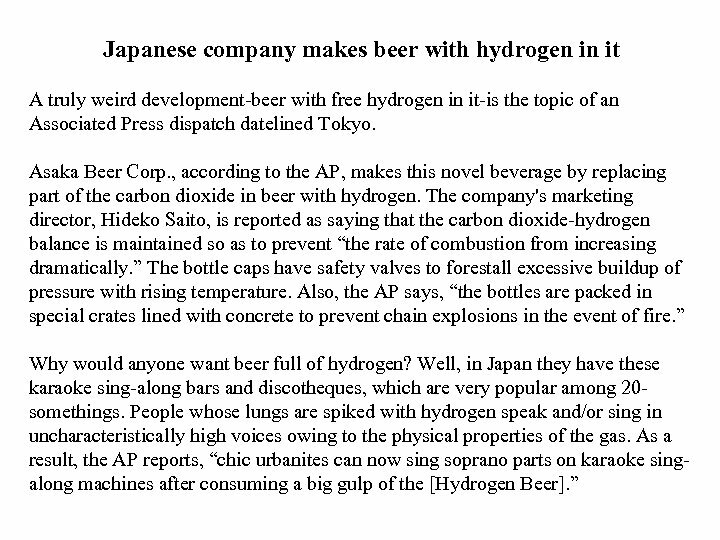 The waters were purchased in different stores when possible, or else from different shipments. The bottles usually carried no lot numbers, so nothing definitive can be said about statistical differences among samples. 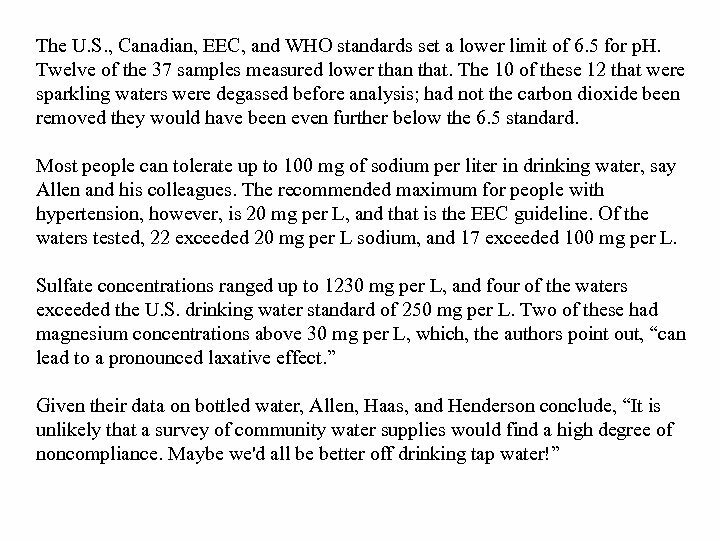 Allen and his colleagues compared their analytical findings with drinking water standards for the U. S. , Canada, the European Economic Community (EEC), and the World Health Organization (WHO). Of the 37 waters analyzed, 24 were out of line with one or more requirements of the U. S. drinking water standards. Four of the 24 were domestic brands. 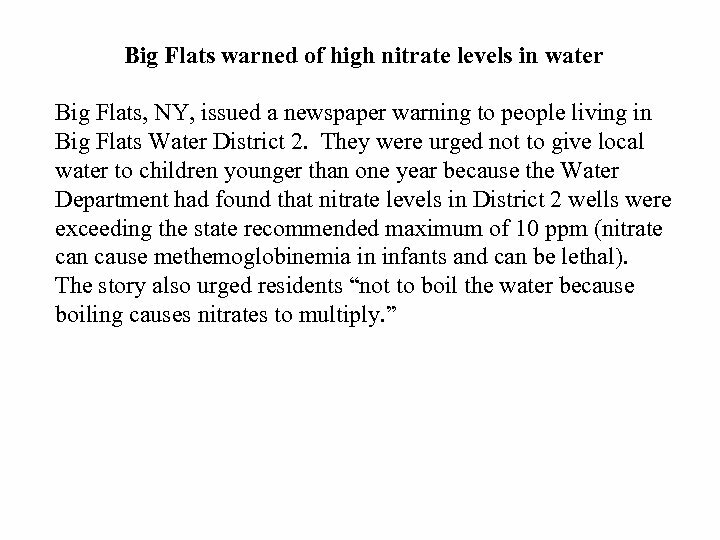 All waters tested, the authors report, were under the limits for barium, calcium, cadmium, chromium, lead, nitrate, and zinc; cobalt silver, and nickel were undetectable. No standards apply to beryllium, molybdenum, or tin, but very little of any of them was found in any sample. Among other parameters with no standards, alkalinity ranged from 4 to 3476 mg Ca. 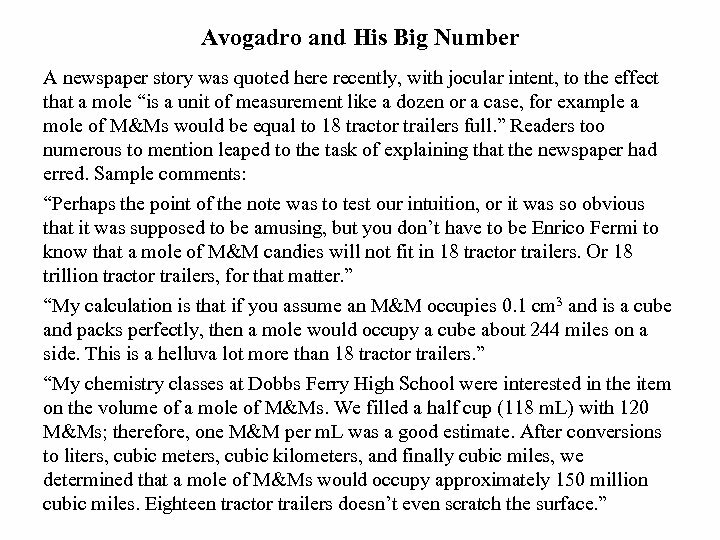 CO 3 per L. Allen and his coworkers think anything over 500 mg per L is significantly high, and they found such levels in 15 of the 37 samples tested. 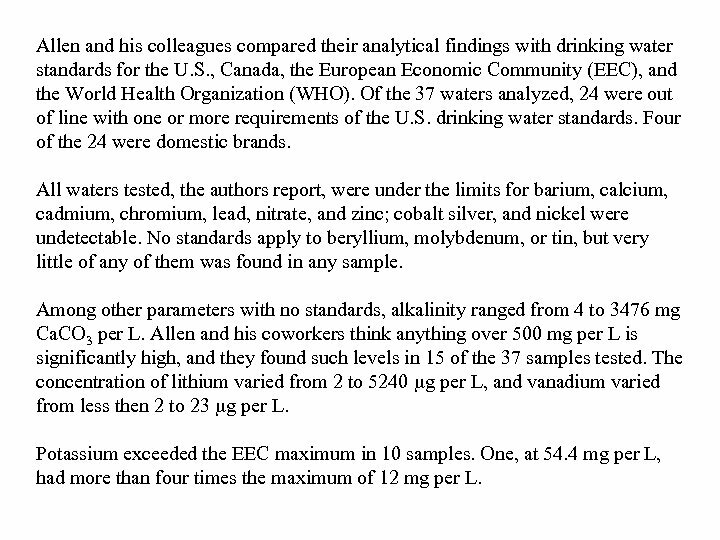 The concentration of lithium varied from 2 to 5240 g per L, and vanadium varied from less then 2 to 23 g per L. Potassium exceeded the EEC maximum in 10 samples. One, at 54. 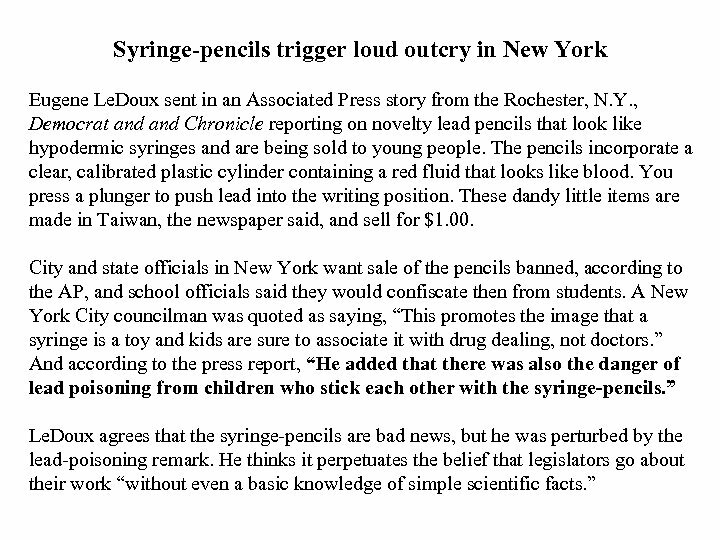 4 mg per L, had more than four times the maximum of 12 mg per L.
An anonymous contributor, who wrote, “I can't stop laughing, ” sent in a newspaper story about three janitors who in the utility room of an elementary school in California tried to euthanize a gopher that a student had found on school grounds and brought to them. 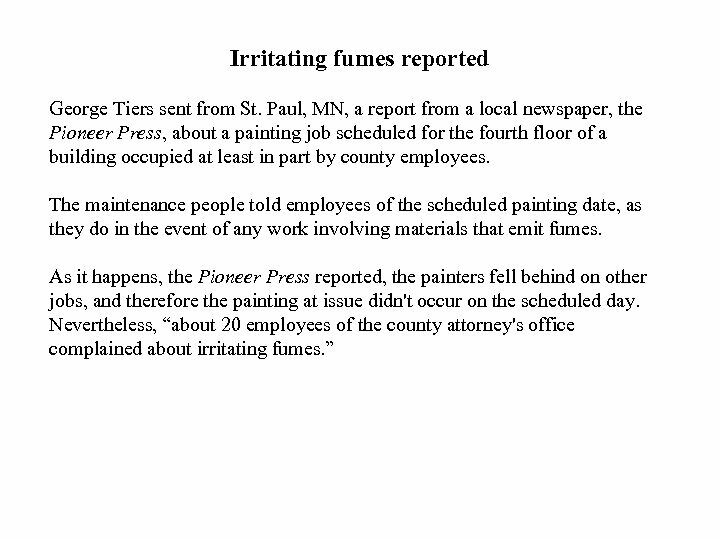 To that end they sprayed the rodent with several cans of “a freezing solvent used to clean gum and wax off floors. 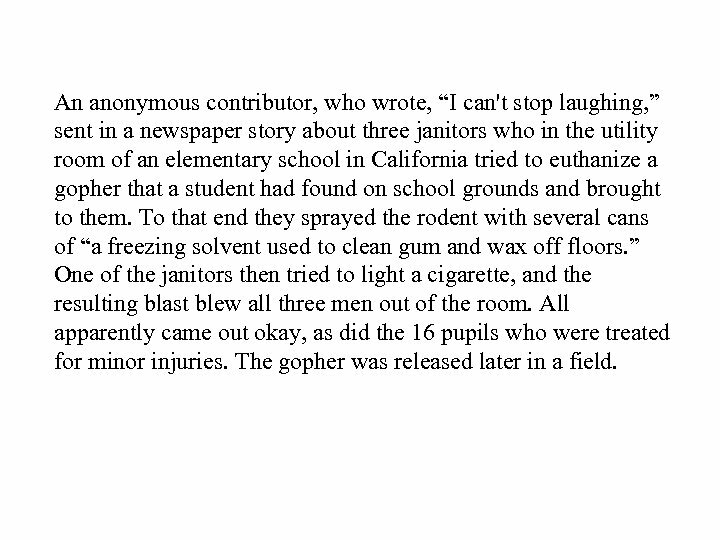 ” One of the janitors then tried to light a cigarette, and the resulting blast blew all three men out of the room. All apparently came out okay, as did the 16 pupils who were treated for minor injuries. The gopher was released later in a field. 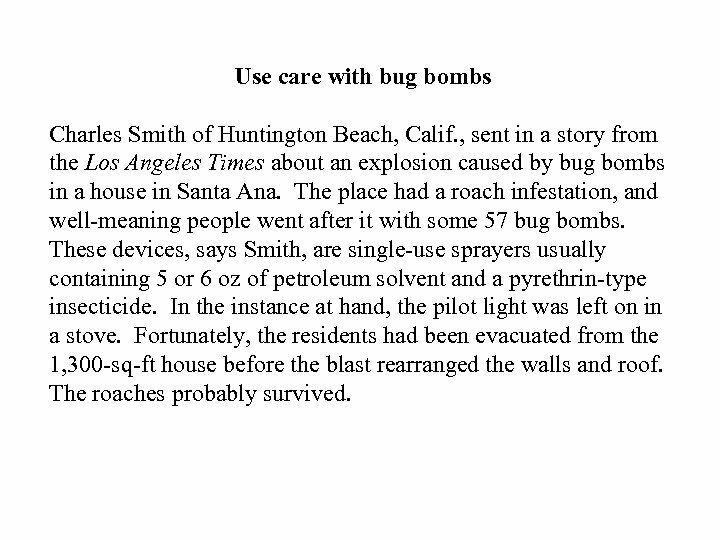 Use care with bug bombs Charles Smith of Huntington Beach, Calif. , sent in a story from the Los Angeles Times about an explosion caused by bug bombs in a house in Santa Ana. The place had a roach infestation, and well-meaning people went after it with some 57 bug bombs. These devices, says Smith, are single-use sprayers usually containing 5 or 6 oz of petroleum solvent and a pyrethrin-type insecticide. In the instance at hand, the pilot light was left on in a stove. Fortunately, the residents had been evacuated from the 1, 300 -sq-ft house before the blast rearranged the walls and roof. The roaches probably survived. 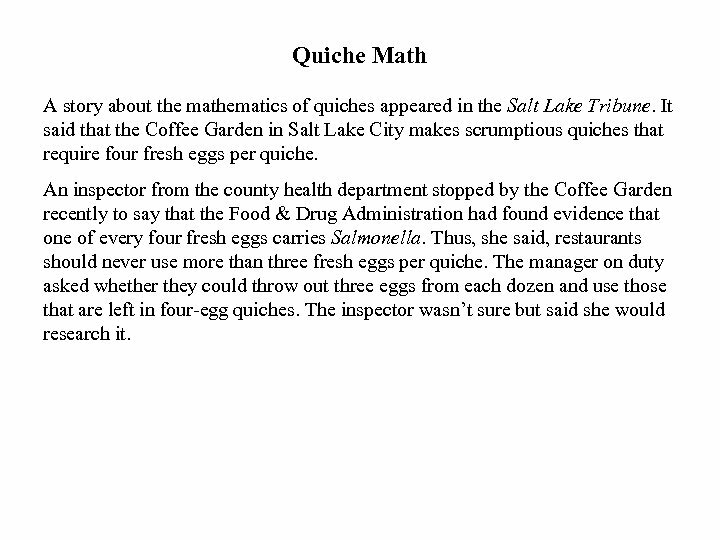 Quiche Math A story about the mathematics of quiches appeared in the Salt Lake Tribune. It said that the Coffee Garden in Salt Lake City makes scrumptious quiches that require four fresh eggs per quiche. An inspector from the county health department stopped by the Coffee Garden recently to say that the Food & Drug Administration had found evidence that one of every four fresh eggs carries Salmonella. Thus, she said, restaurants should never use more than three fresh eggs per quiche. The manager on duty asked whether they could throw out three eggs from each dozen and use those that are left in four-egg quiches. The inspector wasn’t sure but said she would research it. 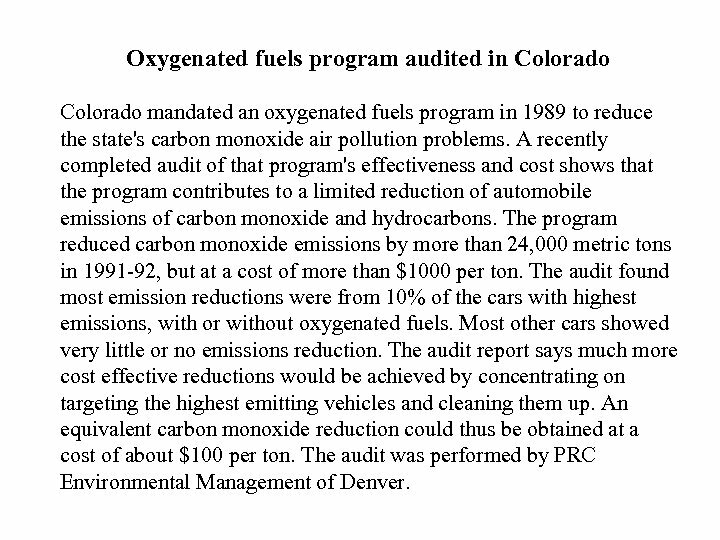 Oxygenated fuels program audited in Colorado mandated an oxygenated fuels program in 1989 to reduce the state's carbon monoxide air pollution problems. A recently completed audit of that program's effectiveness and cost shows that the program contributes to a limited reduction of automobile emissions of carbon monoxide and hydrocarbons. The program reduced carbon monoxide emissions by more than 24, 000 metric tons in 1991 -92, but at a cost of more than $1000 per ton. The audit found most emission reductions were from 10% of the cars with highest emissions, with or without oxygenated fuels. Most other cars showed very little or no emissions reduction. The audit report says much more cost effective reductions would be achieved by concentrating on targeting the highest emitting vehicles and cleaning them up. An equivalent carbon monoxide reduction could thus be obtained at a cost of about $100 per ton. The audit was performed by PRC Environmental Management of Denver. 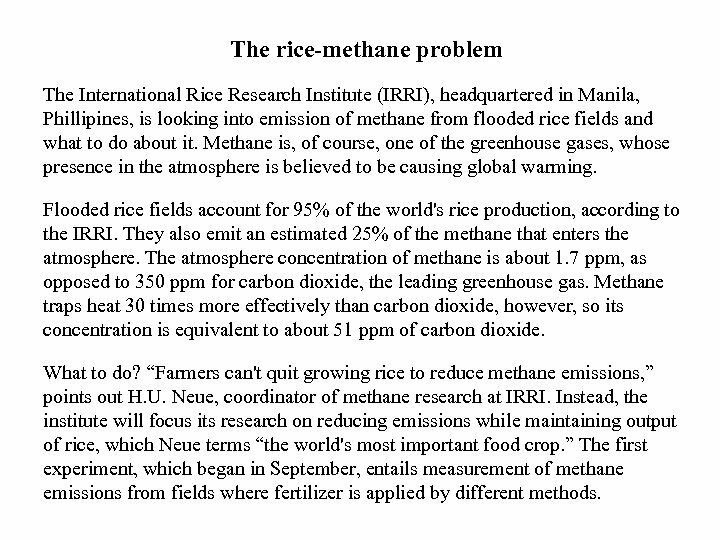 The rice-methane problem The International Rice Research Institute (IRRI), headquartered in Manila, Phillipines, is looking into emission of methane from flooded rice fields and what to do about it. 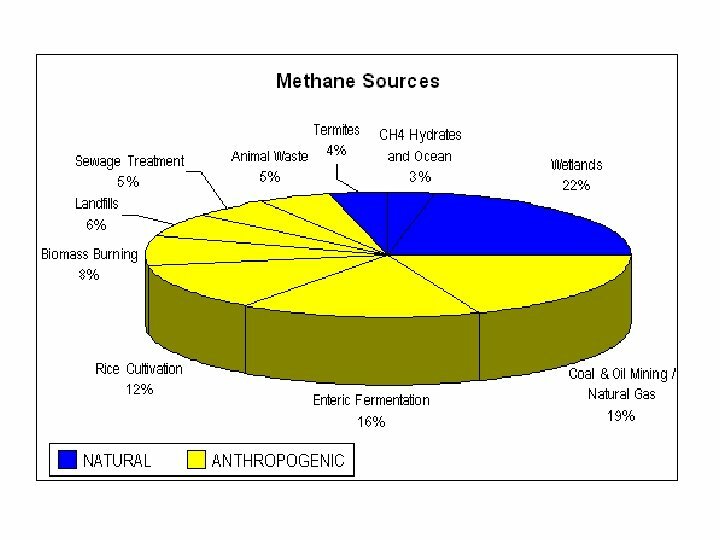 Methane is, of course, one of the greenhouse gases, whose presence in the atmosphere is believed to be causing global warming. Flooded rice fields account for 95% of the world's rice production, according to the IRRI. 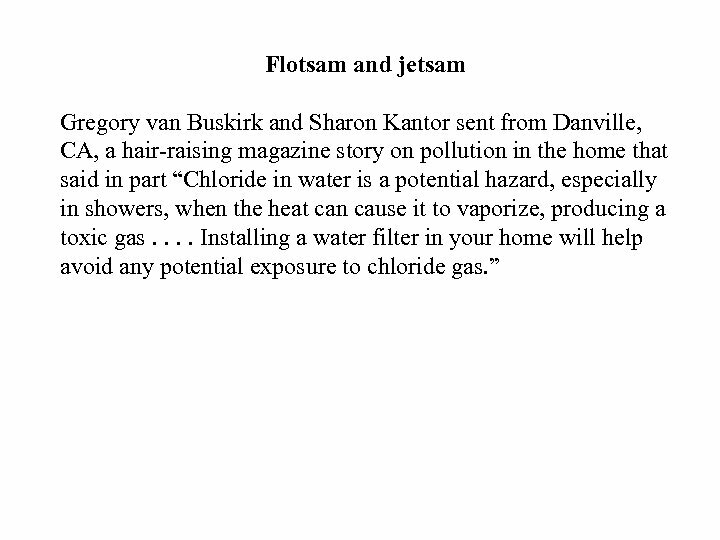 They also emit an estimated 25% of the methane that enters the atmosphere. The atmosphere concentration of methane is about 1. 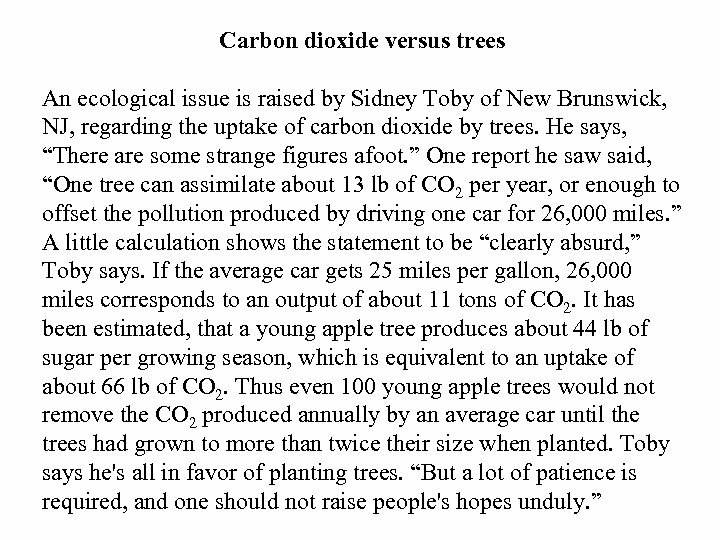 7 ppm, as opposed to 350 ppm for carbon dioxide, the leading greenhouse gas. Methane traps heat 30 times more effectively than carbon dioxide, however, so its concentration is equivalent to about 51 ppm of carbon dioxide. What to do? “Farmers can't quit growing rice to reduce methane emissions, ” points out H. U. Neue, coordinator of methane research at IRRI. Instead, the institute will focus its research on reducing emissions while maintaining output of rice, which Neue terms “the world's most important food crop. ” The first experiment, which began in September, entails measurement of methane emissions from fields where fertilizer is applied by different methods. Meanwhile, Angela Moss of Britain's Agricultural Development Advisory Service (ADAS) said at a meeting of the Society of Chemical Industry that atmospheric levels of methane are rising at twice the rate of carbon dioxide. Methane, moreover, is a much more potent greenhouse gas than carbon dioxide, she pointed out. Enteric fermentation accounts for 15% of global methane emissions, with dairy cows the worst offenders among ruminants. ADAS scientists are studying the effects of diet on emission of methane by ruminants. Barley grain appears to be the worst diet and green grass the best. 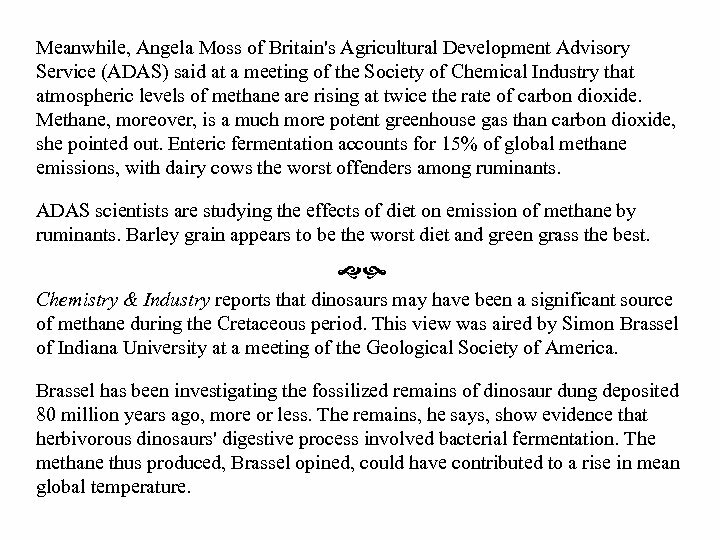 Chemistry & Industry reports that dinosaurs may have been a significant source of methane during the Cretaceous period. This view was aired by Simon Brassel of Indiana University at a meeting of the Geological Society of America. Brassel has been investigating the fossilized remains of dinosaur dung deposited 80 million years ago, more or less. The remains, he says, show evidence that herbivorous dinosaurs' digestive process involved bacterial fermentation. The methane thus produced, Brassel opined, could have contributed to a rise in mean global temperature. Australia fights methane By early, June, Australia farmers had signed up more than 635, 000 sheep and 410, 000 cattle to take part in a methane vaccine program proposed by Australia's national science agency, the Commonwealth Scientific & Industrial Research Organization. The idea is to reduce the animals' emissions of methane, a greenhouse gas, and thus slow global warming. Sheep and cattle produce about 14% of Australia's total greenhouse emissions, measured in CO 2 equivalents. The methane vaccine “discourages” methanogenic archae, ancient organisms in the animals' rumen that produce methane by breaking down feed. Current experimental results suggest that the vaccine will reduce methane emissions by about 20%, the equivalent of about 300, 000 metric tones of carbon dioxide annually. Reduction of methane from feed leaves more nutrients for the animal, so the vaccine also is expected to yield modest gains in animals' liveweight and, in sheep, wool production. 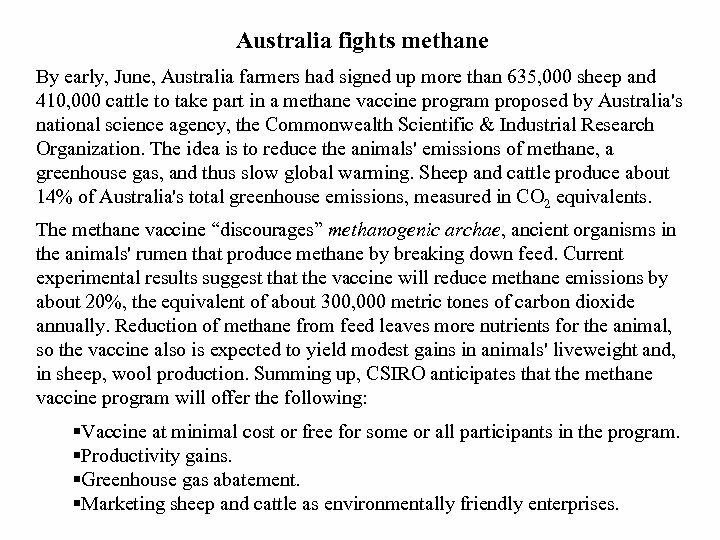 Summing up, CSIRO anticipates that the methane vaccine program will offer the following: §Vaccine at minimal cost or free for some or all participants in the program. §Productivity gains. §Greenhouse gas abatement. §Marketing sheep and cattle as environmentally friendly enterprises. 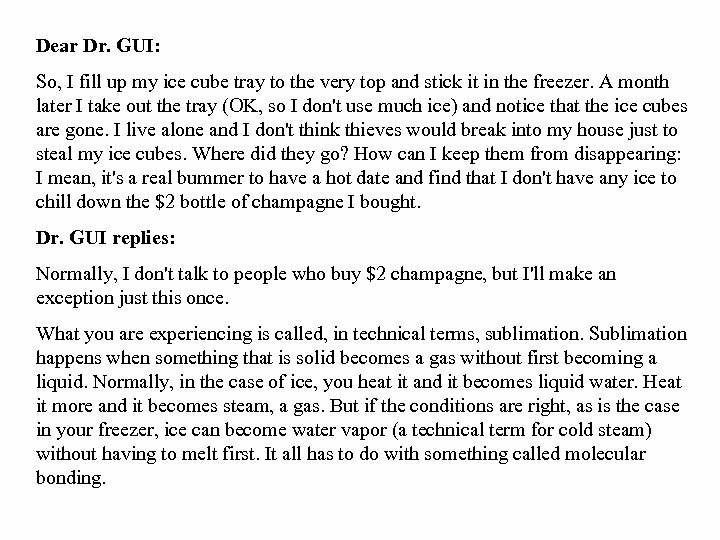 Dear Dr. GUI: So, I fill up my ice cube tray to the very top and stick it in the freezer. A month later I take out the tray (OK, so I don't use much ice) and notice that the ice cubes are gone. I live alone and I don't think thieves would break into my house just to steal my ice cubes. Where did they go? How can I keep them from disappearing: I mean, it's a real bummer to have a hot date and find that I don't have any ice to chill down the $2 bottle of champagne I bought. 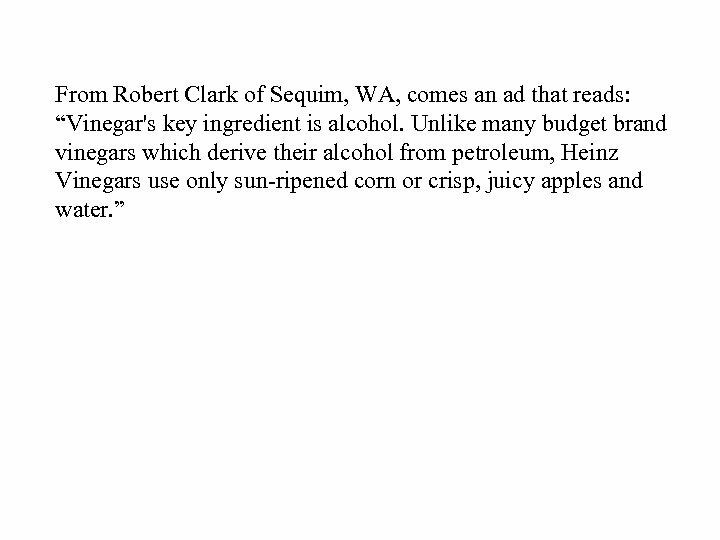 Dr. GUI replies: Normally, I don't talk to people who buy $2 champagne, but I'll make an exception just this once. 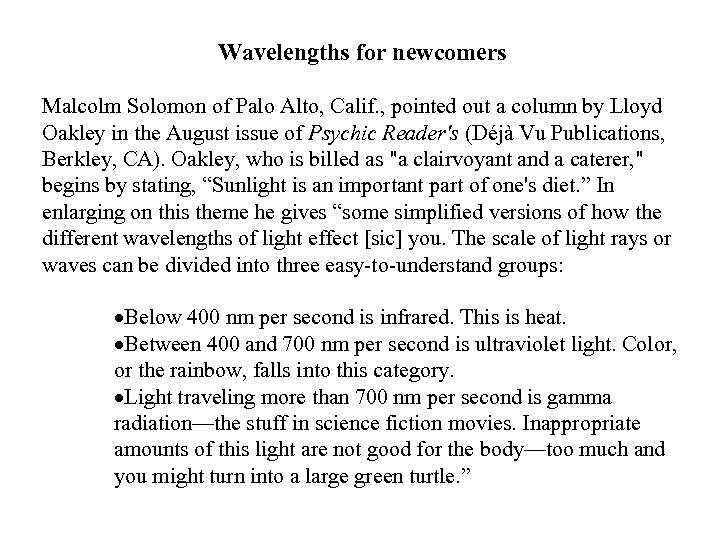 What you are experiencing is called, in technical terms, sublimation. 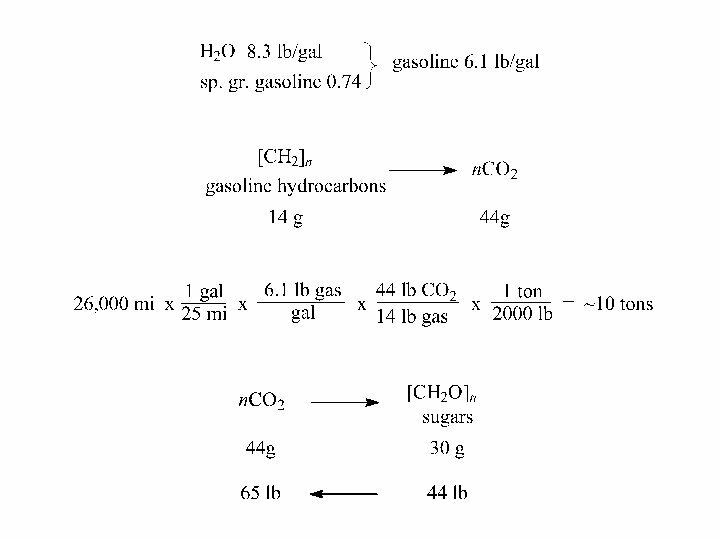 Sublimation happens when something that is solid becomes a gas without first becoming a liquid. Normally, in the case of ice, you heat it and it becomes liquid water. Heat it more and it becomes steam, a gas. But if the conditions are right, as is the case in your freezer, ice can become water vapor (a technical term for cold steam) without having to melt first. 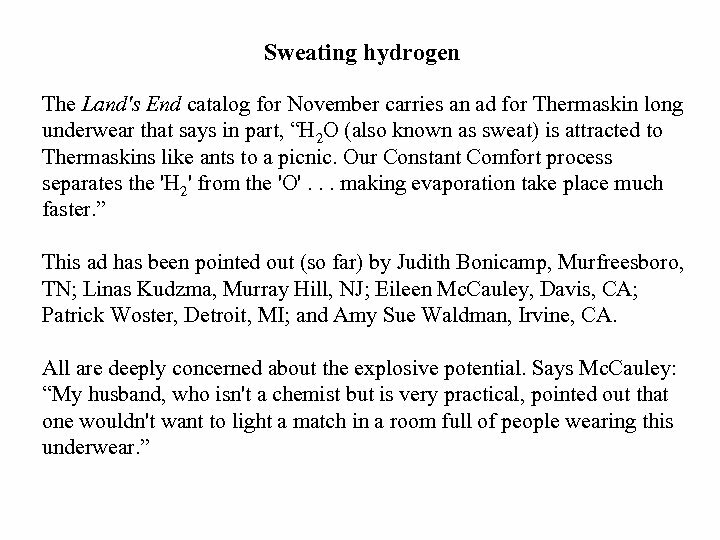 It all has to do with something called molecular bonding. For the longest time scientists believed that molecular bonding, a measure of how well molecules stick together, was something that just happened. 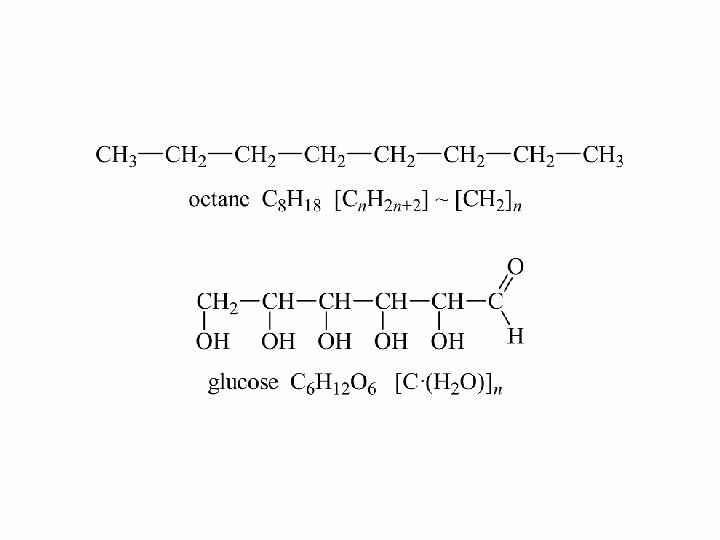 But today psychochemists are starting to understand the true inner feelings of molecules and their reasons for bonding. 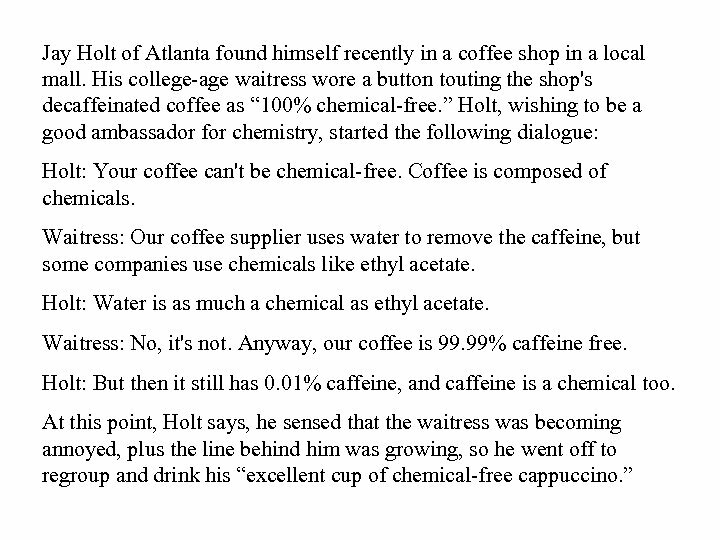 It turns out that molecules do have feelings and those feelings directly affect how willing they are to stick around. Image if someone stuck you in the freezer and ignored you for a month. So, what can you do? Talk to your ice. It worked for plants, and it can work for ice, too. Tell your ice how grateful you are that it exists. Encourage your ice to keep bonding. Remind it of the long-term benefits of faithful bonding relationships. Sing songs of empowerment to it, such as “We Shall Overcome” and “Frosty, the Snowman. 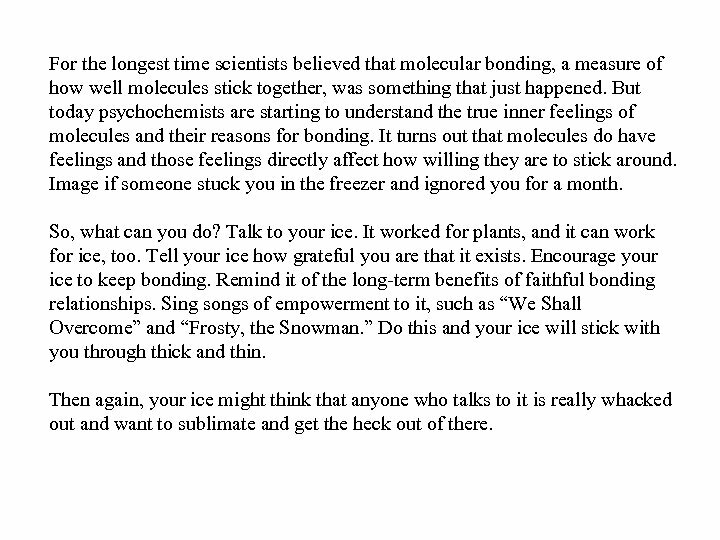 ” Do this and your ice will stick with you through thick and thin. Then again, your ice might think that anyone who talks to it is really whacked out and want to sublimate and get the heck out of there. 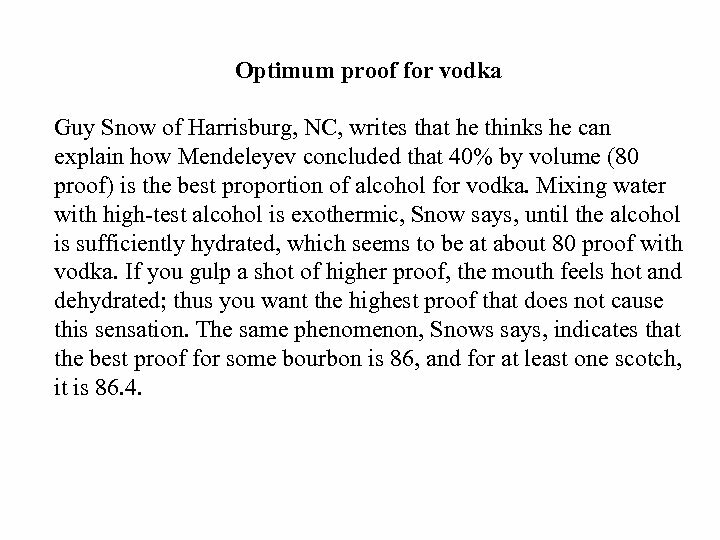 Optimum proof for vodka Guy Snow of Harrisburg, NC, writes that he thinks he can explain how Mendeleyev concluded that 40% by volume (80 proof) is the best proportion of alcohol for vodka. 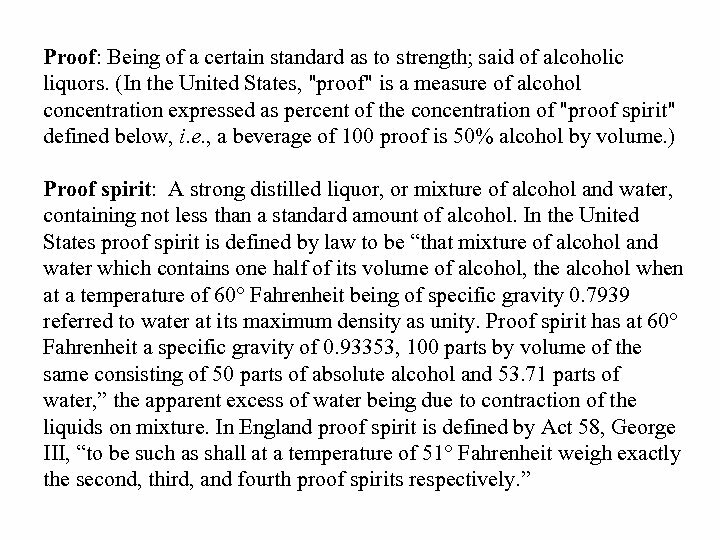 Mixing water with high-test alcohol is exothermic, Snow says, until the alcohol is sufficiently hydrated, which seems to be at about 80 proof with vodka. If you gulp a shot of higher proof, the mouth feels hot and dehydrated; thus you want the highest proof that does not cause this sensation. The same phenomenon, Snows says, indicates that the best proof for some bourbon is 86, and for at least one scotch, it is 86. 4. Новинки каталога 06/2012 (октябрь-ноябрь 2012) www.